Its my humble opinion that Crowdsourcing will be a pretty big trend this year. 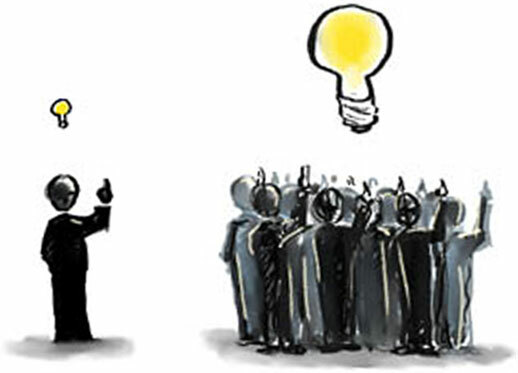 Crowdsourcing is a neologistic compound of Crowd and a short for Outsourcing, for the act of taking tasks traditionally performed by an employee or contractor, and outsourcing them to a group of people or community, through an “open call” to a large group of people (a crowd) asking for contributions. There are a huge range of opportunities for cash-strapped marketers and businesses with crowdsourcing by tapping an online community for ideas on how to advance a brand, or develop a product or, in many cases, both. However, we must advance with caution, as crowdsourcing can be perilous! You are a marketing manager at a startup company, with no budget, and no resources to help you. You decide that you need help from your pals on Facebook, Twitter, LinkedIn to come up with a new name for a product line your company is launching. So you Tweet it out, Facebook it up, and shout it out on LinkedIn. The incentive you offer? Not much – couple hundred bucks on a BestBuy card. Problem : You underestimated the desire for people to be heard and to provide input! Forget the incentive. People want to do this for bragging rights! So you’ve now got 200 entries! Holy cow – that’s awesome! Well, isn’t it? Don’t forget – you have no resources. So now you have 200 entries to sift through and try to come to a decision on your own… BUT – how about selecting the top 10 options and crowdsourcing (well, polling) your community again? Phew – crisis averted! Now how long did it take to go through this process? Yep – maybe you could’ve come up with a name by yourself in the time it took to manage the crowdsourcing process. These are still early days, though, and as this model takes off supporters say such problems will be resolved. More industry resources are being devoted to crowdsourcing, which should also help. Last October, for instance, a new advertising agency, Victors & Spoils, was launched by former executives from Crispin, Porter + Bogusky, billing itself the first creative ad agency built on crowdsourcing principles. 2. Brand-sponsored initiatives or forums that depend on crowdsourcing. I’ve included those that are no longer active as well, for reference. Companies are getting smarter about crowdsourcing in general, according to Matthew Greeley, CEO and founder, Brightidea.com (via DM News). Previous Post I’m Writing On My Walls! YES YES YES I love it. I see lots of useful ways to use this ! HA! I should have read this before I wrote my blog post. Could have linked directly to it. Ahh well, I missed the post but I caught the idea. Thanks for suggesting crowd sourcing for Blue Gypsy, Inc. I quite like reading throuyh a post that can make people think. Also, thank for allowing for mee to comment! means of him as no one else realize such unique about my difficulty. birthday of Jesus Christ which is being celebrating in the month of December. tto obtain latest updates, so where cann i do it please assist. I’m sorry! I’m also noticing a bunch of spam getting through here too, so let me check on the settings and see what I can do.